Slice the vanilla pod in half and use a knife to scrape the seeds out. Pour the sugar, water, cinnamon, and vanilla (seeds and the pod) into a saucepan and bring to the boil. Immerse the peeled pears into the syrup for 10 minutes. Remove them from and then let them cool. 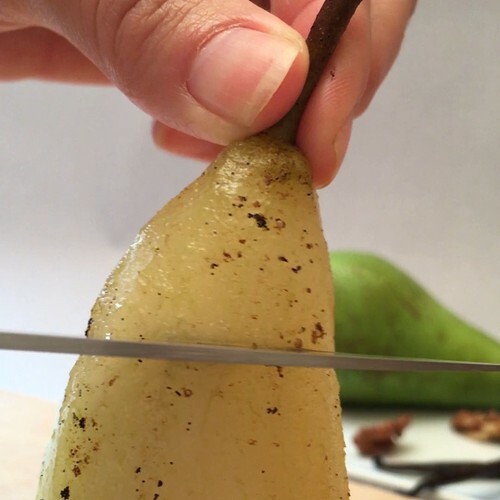 Cut and keep the top of the pears, and remove the stem and the cores with the apple corer. Place the pears upright on baking paper on a baking tray. Mix the nuts with the caramel sauce, and fill the inside of the pears with the mix. Then put the pear tops back on. Unroll the pastry sheet, cut it into 2cm strips and wrap the strips around the pear. Brush the pastry with egg yolk. Bake for 30 minutes at 170°C. Serve the pears on caramel sauce, then pour melted chocolate over the pears, and decorate with a few chopped walnuts. Enjoy!